A green heron perches near the water's edge at its favorite fishing spot, with purple loosestrife on the shore behind it. Green herons are well equipped for fishing with their keen eyesight, sturdy bills, and long S-shaped necks. Besides the familiar great blue herons that have nested on Mill Pond for decades, smaller and more solitary green herons frequent Westborough's wooded ponds and swamps. They are known as "tool-using birds" for their surprising habit of using bait to catch fish. Green herons (Butorides virescens) are shy, stocky birds about the size of a crow. Their colors are dark, mostly brown and blue-grey with a dull green back, so they blend in with the woods surrounding the ponds and wetlands where they live and hunt. You might spot a green heron near the edge of any pond or swamp in our area. At this time of year they're still likely to be around, although they do move south for the winter. Some may be passing through. If you get too close to a green heron, it is likely to fly away squawking. Mill Pond is always a good place to look. Green herons tend to hide out in the shadows near shallow water, patiently waiting and watching for an unsuspecting fish to swim past. They also perch on branches near the water's edge. For green herons, hunting usually means fishing. Not only do they grab fish that happen to come near, but they also sometimes lure fish into striking range by placing bait on the surface of the water. For bait, people have seen green herons using bread crusts, half-dead crickets or earthworms, twigs, moss, bits of styrofoam, and even downy feathers deliberately plucked from their own body. When fish swim over to invesitage, the green heron strikes. Green herons will even re-position the bait on the water's surface, keeping it from floating out of strking range. Not surprisingly, live bait often works best. Adult herons are better at fishing with bait than younger herons. Their use of bait has earned some notoriety for green herons. For a very long time, most people believed that the ability to use tools was a uniquely human trait. Not so any longer! In recent decades, as scientists have closely studied animals in the wild, they have observed tool use in animals such as chimpanzees, certain wasps and a few different birds, including green herons. Like other herons, green herons sometimes move their feet around in the water to stir up fish or other prey. Green herons eat minnows, sunfish, catfish, and perch, among other fish. They also take frogs, tadpoles, snakes, dragonflies, crayfish, and grasshoppers—whatever comes close enough. Green herons are well equipped to fish. Like other herons, they have keen eyesight, sturdy bills, and long necks that can curve into an S-shape. They pull their heads back, poised to strike at their prey. They also rest and fly with their necks curved back. After departing this area for the winter, green herons will return in March or April for the breeding season, probably before the great blue herons return to Mill Pond. Green herons pair up during the breeding season. The pairs nest alone rather than in colonies as the great blue herons do. 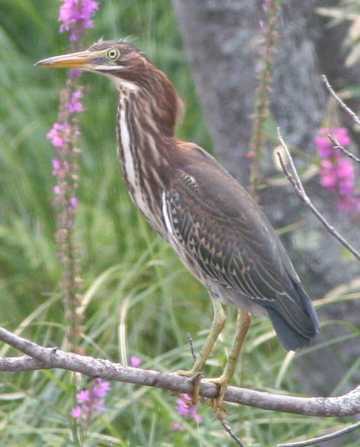 They defend their nesting and feeding territories from other green herons. Green heron pairs often build their nests in tree branches overhanging the water. Their nests look like baskets of sticks. They lay two to four green eggs over about a week's time. The eggs hatch about three weeks later. Both parents feed the young and keep them warm. The young begin to fly after two and a half weeks and become independent after about a month. After breeding, the parents may wander, going their separate ways. Green herons are probably more common than we realize because they are shy and hard to spot. Recreational activities such as canoeing can discourage them from feeding along waterways, but their diet is broad enough that they can use small ponds and swamps that would not supply enough food for other kinds of herons. In the long run, development may cause problems for green herons because it often involves removing wetlands.